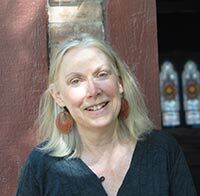 Susan Dedell has been Director of Music at St. Michael’s church since 1992. She also directs the Brattleboro Concert Choir, an 85-voice chorus that is a program of the Brattleboro Music Center. Susan has also directed a variety of opera, oratorio, and music theater productions, as well as enjoying an active concert and recital schedule as a pianist. Susan has been working with churches professionally since her teen years and finds great satisfaction in endeavoring to foster musical, spiritual, and fellowship growth in equal parts. She credits three choral conductors with guiding her career development: high-school choral director David Wikman, who introduced her to early music; college mentor Maynard Klein (Professor of Choral Arts and director of University Choirs at the University of Michigan), who taught her that music was an act of love; and Blanche Moyse (Artistic Director of the New England Bach Festival) with whom she worked closely for over a decade. 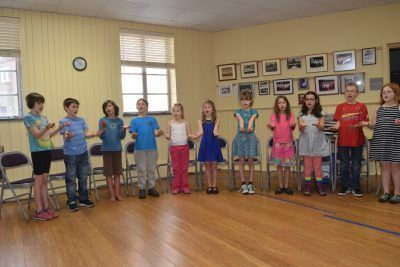 The St. Michael’s choir is a lively and friendly group of singers, currently numbering 27 members, with ages ranging from the teens on up. 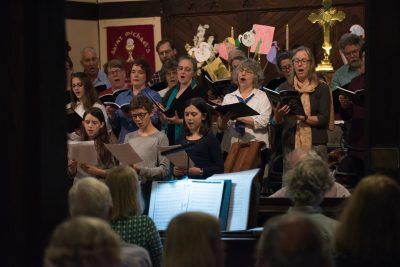 The all-volunteer choir meets weekly on Sunday morning from 8:45-10:00 am, with additional rehearsals scattered throughout the year and an all-day retreat in preparation for the seasons of Lent and Easter. In addition to weekly services, the choir sings an annual Advent Service of Lessons and Carols, seasonal Evensong and Taizé services, and occasional special programming. The repertoire of the choir is very wide, including traditional Anglican anthems and service music, gospel and spirituals, American traditional music, a variety of early music, and new compositions by exciting contemporary composers. There is no audition for the choir, but music literacy and/or choral experience is helpful.